Our group of 9 members and support staff of 25 successfully completed a trek through the Helambu and Langtang districts of northeast Nepal. Many in our group enjoyed sightseeing in and around Kathmandu before the expedition, visiting the temples and palaces of Bodnath, Swayambodh, Pashaputnah, and Bakhtapuhr. We experienced the rich, and strange to Westerners, culture, history and Hindhu-Buddhist religions of the Kathmandu Valley. Our group consisted of five members of the Central Indiana Wilderness Club (Tim, Jim, Cindy, Nina and me), my friend from previous expeditions, Jay of LA, my old college and Rugby mate, Elliot, from South Africa, and his friend Hector, also from South Africa, and Elliot's camp counselor pal, Diane from Tampa. We brought diverse interests, personalities and styles to the group. Yet, we all appreciated the magnificent beauty of the Himalayas and were extremely impressed with the considerate treatment we received from the staff of Adventure Geo Treks, most especially our superhuman sirdar, Ganesh. We spent most of the first day on winding mountain roads riding in a bus from Kathmandu to the landslide that blocks the road outside the village of Dunche. Gear was transported by our porters from the bus across the wet mess of the landslide to another bus, while we walked the two miles to a lodge in Dunche. It was the last time we slept under a roof until we reached the end of the trek. The first few days established the weather pattern we experienced most of the 16 days on the trails, beautiful clear, blue skies in the morning, cloudy afternoons, and then a huge clear, starry sky at night. We camped above the sacred lakes of Gosainkunda, and hiked around the lakes and pilgrim shelters. The following day we were drenched with rain on the trail to Gopte. A Korean trekker informed us that "our culture is too loud," while we huddled around a stove at lunchtime in a crowed teahouse. I managed to do myself proud by falling and bruising a shoulder muscle, after losing the trail in the rain. Jim became the most popular man in Helambu and Langtang. He not only gave out school supplies (as did several in our group), but gave stuffed animals to every child we met. We discovered (or they discovered us) the dreaded bloodsucking leeches of Tarkeghyang in a second day of rain, as we trekked through a "sky forest." But then we gained altitude and left villages and all other trekking groups behind as we crossed the mountain ridge dividing Helambu from Langtang. 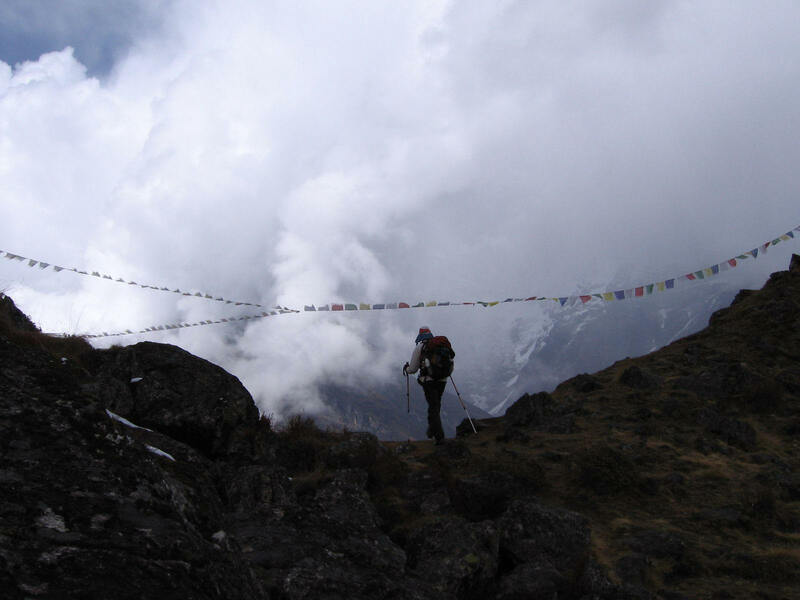 Our greatest challenge of the trek was getting all of us, our staff and gear over the 17,000 ft. Ganja La. We knew the pass was very high and snow-covered requiring ropes to cross. However, the two days of rain meant two days of snow building on top of the pass. It took several hours for Ganesh to figure out how to fix enough rope to get everyone over the pass, and the temperature was dropping, so frostbite was becoming a concern. After we glissade down the last drop over the pass, Ram, our cook and I struck out in thigh-deep snow to find a campsite. We were unable to find one until after dark, and we were all exhausted and cold by the time tents were set up and we could crawl into our sleeping bags. Amazingly, Ram managed to brew tea and boil soup for everyone. We had a second day in deep snow, and Ganesh had to fix ropes again to get everyone down a lesser pass, which was also quite steep with thigh-deep snow. Elliot, Ram and I post-holed out front to break trail, while Ganesh made sure everyone made it over the second pass. Despite working much harder than anyone else, post-holing up and down the sheer passes to fix rope for the others, Ganesh always smiled, laughed and encouraged the rest of us to keep our spirits up. Kyanjin Gompa is a Sherpa-Tibetan settlement just south of the border with Tibet, and the north terminal point of the trek. Four of our members, without a rest day, hiked up the 16,000 ft. Chergori from Kyanjin. 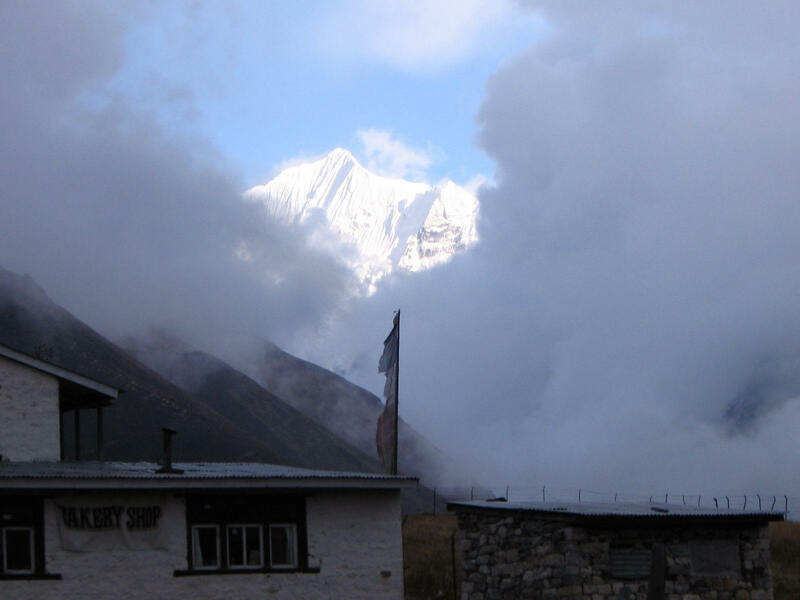 The next day they summitted 19,000 ft. Yala Peak, led by Ganesh and climbing guide Doma Sherpa. The other five rested, visited the Gompa (monastery), shopped with the Tibetan traders and took day hikes around Kyanjin. I was glad for the opportunity to rest, as I had climbed Yala in 2004, and enjoyed one of the most fun hikes of my life with Tim up to Kyanjin Glacier. We had easy down hikes the next two days to Langtang Village and then Ghora Tabela. 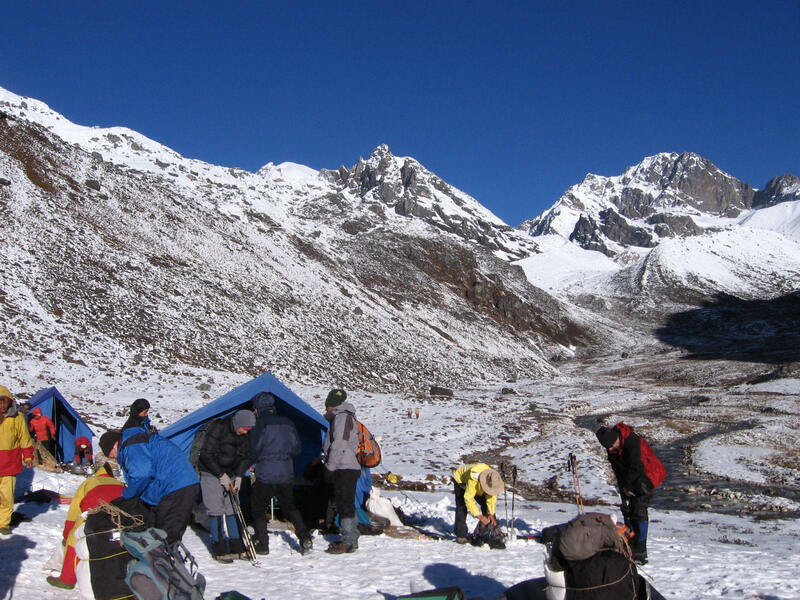 In Langtang Village we had a traditional end-of-trek party with our staff. Ram slaughtered a ram for its meat and made stew, as part of a five course meal. He made us celebratory cakes several times, of which Jay usually ate half. I distributed the tips our group generously gave to the staff, after which there was much singing, dancing, and drinking of rakshi (local fire water). From Ghora Tabela we flew a helicopter back to Kathmandu for last views of the highest mountains and deepest valleys in the world. We all had a couple days of shopping in Kathmandu to buy the typical Nepali presents for friends and family -- kukri knives, prayer wheels, embroidered T-shirts, jewelry, pash mina, thangkas, etc. Niru Rai, the owner of Adventure Geo Treks, hosted our entire group at his home for a 7-course feast. Many toasts were offered, especially to Ganesh for serving us so well and to Niru for being such a splendid host and putting together all the pieces which gave us such a wonderful experience. Tim and I ended the adventure with a night in Bangkok at a 5-star hotel overlooking the Cho Prahya River. We had dinner at a local restaurant where nerdy Thai college students got hammered and sang American rock and roll.